United Arab Emirates The United Arab Emirates is on the southeastern tip of the Arabian Peninsula. It is a conglomeration of ultra-modern, trendy, high-rise cities which attracts tourists to her shores with an array of magnificent beaches, duty-free shopping and tourist attractions. Abu Dhabi is the capital of the UAE and considered one of the most modern cities in the world. Visitors to Abu Dhabi enjoy beautiful gardens and parks, green boulevards and sophisticated high-rise buildings which house luxury hotels and shopping malls. The Jebel Ali Free Trade Zone is found in Dubai, which makes a stop in the city a must for shop-a-holics. For adventure seekers, a host of experiences await including camel treks, desert stargazing, 4x4 trips through sand dunes and cruises aboard a dhow. Best time to visit The best time to visit Dubai is from November to March. This is their winter season so temperature are more bearable. It is also however peak tourist season, so expect the tourist attractions to be extra busy. If you can tolerate the extreme heat and humidity of the summer months you will be able to escape the crowds. Climate and Weather Situated on the Tropic of Cancer, the UAE has a sub-tropical arid climate and is warm and sunny in winter, but hot and humid during the summer months. The coastal areas are extremely humid and rainfall is virtually non-existent. Holders of passports containing an Israeli visa or stamps need to obtain a clearance issued by the C.I.D. (Crime Investigation Department) before arrival. Travel Insurance is mandatory as health care is costly. 96 Hours Visa: This Visa is valid only for 96 hours and is ideal for travellers to the UAE who plan to stay for a period of less than 4 This type of Visa is preferred by travellers having business meetings or taking stopovers en route to their onward journey. Visa is valid for 30 days from the date of issue. No vaccinations are required when visiting the UAE. If however, you are arriving from a yellow fever or cholera-infected area you will need to produce a vaccination certificate Tap water in the major cities is safe to drink, but when out on any excursions it is advisable to drink only bottled water. Medical care is excellent in the main cities. Travel Insurance is mandatory as health care is costly. The Emirates states are all Muslim and local laws and sensitivities should be respected at all times. No alcohol is not served in any restaurants, except in hotels. It is an offence to drink or be drunk in public and the penalties issued are severe. Certain prescribed and over the counter medicines from outside the country are considered a controlled substance within the UAE and will not be allowed into the UAE without prior permission from the UAE Ministry of Health Drug Control Department (DCD). Should you arrive with such medication without permission, you could be subject to prosecution. Dress and behaviour should at all times be modest and women’s clothes should cover the tops of the arms and legs. During the month of Ramadan, it is disrespectful to smoke, drink or eat in public between sunrise and sunset. Cohabiting, adultery and homosexual behaviour are illegal in the UAE. It is also an offence to swear, make rude gestures or show a public display of affection. Tipping practices are similar to most parts of the world. 10 percent is adequate although many hotels and restaurants automatically add a service charge, so it is best to double check the bill. If attending a business meeting you are required to dress in formal business attire. The most frequently used plugs are the flat, three-pin type. An international adapter is recommended. 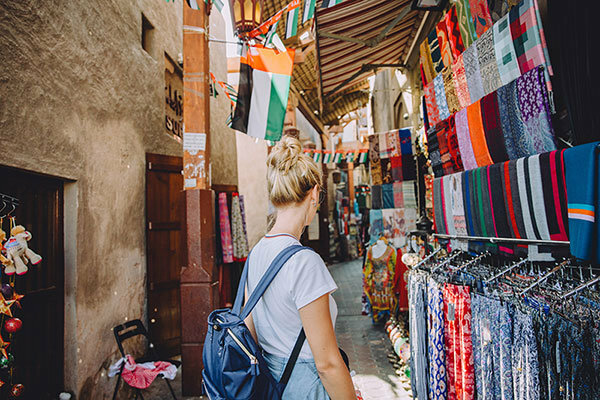 There are over 7,000 weekly flights operated by 125 airlines from 260 destinations on every continent (except Antarctica), so there are a wide range of options to choose from when flying to Dubai. It’s easy to find a carrier to fit any budget or itinerary. Car Rental: To hire a car, you need an international driver’s licence, passport, credit card and third-party insurance. Taxis: Taxis are available to hail nearly everywhere at just about any time, day or night. Taxis are reasonably priced however the rates per kilometer does change depending on a few factors, like tolls or the time of day. Bus: There are nearly 1,500 buses circulating around the city. Bus stops are generally airconditioned. Travel like a resident on the city bus or book an open-top hop-on, hop-off bus tour to hit the main tourist sites. The Nol smart card allows you to pay not only your bus fares, but also your metro fees. Dubai Metro: Dubai Metro tickets must be purchased in the form of a Nol card – which can also be used to pay for bus, tram and taxi fare – and rides can cost as little as AED3. The currency of the United Arab Emirates is the Dirham (AED), which is divided into 100 fils. All major currencies are readily exchanged at banks and large hotels. The Dirham is fixed against the US Dollar. Arabic is the official language of the Emirates, but English is widely used. The international code for the United Arab Emirates is +971. Local mobile phone networks provide wide coverage throughout the country. Internet cafes are widely available, and most hotels have high-speed internet access. The internet is censored to filter out any material and websites deemed undesirable by the authorities.